The Pelican 1690 Transport Case with Foam (Black) is an unbreakable, watertight, airtight, dustproof, chemical resistant and corrosion proof hard case used to carry any kind of equipment that needs to be protected from the elements. It is made of Ultra-high Impact structural copolymer that makes it extremely strong and durable. It has a 0.25" (6.4 mm) neoprene o-ring, easy open, double throw latches that seal perfectly and includes an automatic purge valve for quick equalization after changes in atmospheric pressure. Box Dimensions (LxWxH) 33.0 x 29.0 x 18.0"
1690 Transport Case with Foam (Black) is rated 4.9 out of 5 by 27. Rated 5 out of 5 by William from There a lot of case for the money This thing is massive. I didn't bother trying to figure out how I would use the space before getting it but once it arrived I realized my gear was no longer going to fit in my trunk. I was able to fit all my gear with the exception of my lighting equipment and still had more room that's with my ronin m and atomos. If you have a lot of gear or plan on having a lot of gear in the future this is your case. It's huge but I know my gear is safe and the wheels and handle seem to be holding up really well. Buy this case or one of the smaller version the build quality is worth the extra money! Rated 5 out of 5 by Anonymous from 1690 Pelican Transport Case Pelican proves once again why they are the standard for equipment cases. This case is used to safely transport a Sony HDCAM SR deck around NYC. It protects the deck not only from bumpy taxi/livery rides, but this year from the extreme elements (have you ever transported a HDCAM deck in the snow, it isn't easy). I have used Pelican cases for various equipment over the years (film cameras, DAT recorders, Digibeta/DVCAM decks) and they have never failed me. The 1690 has the usual handle on the top of the case, but also has one on the back that extends and retracts making the handling & steering of the case much easier. Rated 5 out of 5 by Griffin from Perfection in the shape of a case. My initial impression of this case was that it was extremely heavy. Being 43 lbs (while empty with only the foam) makes this a very hefty case. I knew what I was getting into, so I don't mind. The structural stability and quality make up for the weight. The size of it doesn't matter so much, as long as it is what you need. I use it to store two AB800s, a Vagabond II, beauty dish, reflectors, remotes and random cables. Holds all of this very securely. The pick-n-pluck foam is really cool and easy to customize. Things will not move around in here. My actual experience: when fully loaded, this case weighs close to 100 pounds. I could lift that normally, but because of the size and awkwardness of the case, that proves difficult. No matter, the case has a suitcase-like retractable handle with wheels to move around. Wheels are buttery-smooth. And on both sides are huge flip-up handles, perfect for you and another person to hoist it up into the trunk of a car or onto a platform for unpacking. It's not long enough to hold my tripods or octabox, but I knew that ahead of time and have a case for them anyways. My use: as stated, is to hold most of my lighting gear. Comfortably holds two monolights, beauty dish, battery pack, reflectors, radio triggers and misc. cables. I got it to ship from home (San Francisco, CA) out to school in CT. The case had to be durable enough for shipping, while meeting standard shipping specs. Also, I preferably wanted the case to have compatibly with locks on it (the 1690 has 2). The latches on top ensure a secure seal. Speaking of seal, this case is waterproof. Not that I'll ever need to submerge the case, it will offer peace of mind when shlepping it trough snow/rain. Overall, this case is absolutely perfect for my needs. It really shines in that it is a big case, but is easily maneuvered. I would recommend this case to anyone who needs this size. Rated 4 out of 5 by AaronPicot from Huge but sweet I use this to lug around my Mac Pro, 23 Cinema display, keyboard, mouse and a few cables. This works so much better than throwing everything on a blanket in the trunk! I like: The strength of a Pelican case Not having to worry so much about damaging my equipment on the inside or outside. Having everything all together makes moving simplified. I do not like: The combined weight of the case and computer is nearly 100 lbs. The wheels seem too small; won't go through dirt or snow very well, especially with the weight of my computer inside. Rated 5 out of 5 by Kenneth from Large enough to protect a small car If you have a small vehicle you need to protect from the coming floods, get yourself one of these bad boys to store it in! 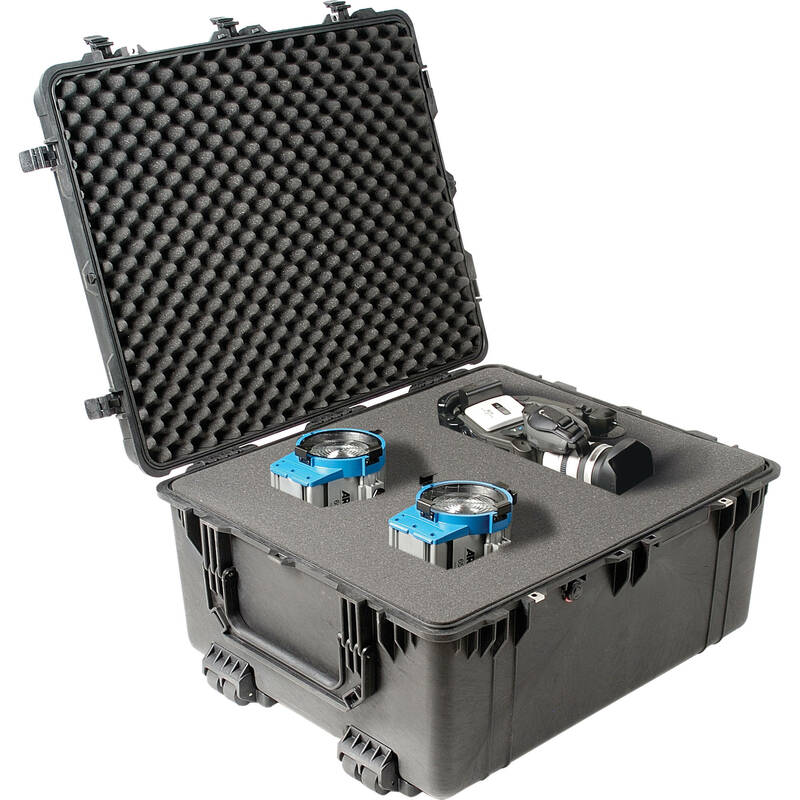 This case is built to the same high standards as other Pelican boxes, yet remains maneuverable and practical with a full load. Looking forward to protecting our investments with this piece of furniture for many years! Rated 5 out of 5 by Anonymous from Indestructible Confidence I purchased the 1690 Transport case to load my gear in and secure it into the back of my SUV. The equipment is well protected and locked in the car which gives me peace of mind when the car is parked. It is also versatile enough that I can ship the case loaded with gear to any location in the world with the same confidence. Rated 4 out of 5 by Lex the driver from mac pro 1 camera gear 2 I am about to embark on a 3000 Klm road trip from Sydney to Alice Springs. I am then going to spend a year in a remote community 3 hours drive from Alice. I needed a case that could protect my computer, lights and camera gear from Dust, moisture and the extreme vibration and shock from driving on rough outback roads and tracks. These cases are ideal for these conditions. The only issue I have with the cases is the size and weight fully loaded. I will not be able to load and unload the vehicle unaided. Rated 5 out of 5 by Anonymous from Serious Transport Case A strong, rugged, well designed transport case. This baby is a beast, with a lot of room. Rollers are a must, handle great addition. Pick foam works nicely for personalizing the case. Large enough for the big 600, 500, 200-400, tripods, and lots more. Has anyone tried to check this case fully loaded on an airplane? Did you have any troubles and around how much did it cost (I understand this will vary by airline ) ? thanks! I have 5 of these and have checked and FedEx Aired them dozens of times over a few years and they still performs very well, although will get a bit chewed up over time. Biggest issue is the handles breaking off and I have to admit some rope replacing the handle works better then the handle. I didn't have to pay for checked bags so I can't comment on that. But the cases still serves me very well.